Mähst Du immer noch den Rasen? Unsere Kite Clinics sind mittlerweile kein Geheimtipp mehr und mit optimalen Flachwasserbedingungen und konstantem Wind gelingen die Tricks problemlos. Für den August haben wir noch ein paar freie Plätze aber Du musst Dich beeilen da wir unsere Gruppen klein halten um Dir die maximale Aufmerksamkeit und Lerngeschwindigkeit bieten zu können. Wenn Du also endlich den Darkslide, Kiteloop oder auch Backloop meistern willst dann schreib uns an und reservier Dir Deinen Platz noch heute. http://www.alwayswindy.com/blog/wp-content/uploads/2018/02/logo5ArialORANGE2018-340-156.jpg 0 0 Mark http://www.alwayswindy.com/blog/wp-content/uploads/2018/02/logo5ArialORANGE2018-340-156.jpg Mark2014-07-30 11:13:012014-07-30 11:13:52Mähst Du immer noch den Rasen? There was a time you could count the amount of female kitesurfers on one hand while there never was any lack of male kitesurfers. Slowly things changed and a lot of that comes down to our sport becoming very accessible and the kites becoming much easier to handle. Even so, the girls that stuck out in competitions or that could keep up with the boys were so few that you could pretty much forecast any competition results by just naming the usual 3 suspects, Bruna, Gisela and Karolina. But good news men – things are changing again and now we have more girls out there that will not only make you wish you had spent some time learning a few more tricks than the usual lawn-mowing (try a clinic of ours maybe?) but that can easily make your local kitesurf hero look a bit “meh”. Watch Colleen Carroll and Sensi Graves in the flatwater lagoons of Northern Brazil ripping it up in style and maybe plan your next holiday with us there too. HIGHLIGHTS : Lighter and Brighter from Vincent Bergeron on Vimeo. Hannah, who now is a Best Kiteboarding team rider, has released her latest kitesurfing video shot in South Africa. Beautiful imagery, especially during those sunset sessions and of course some nice riding by Hannah. Hannah Whiteley ‘Essence’ from Hannah Whiteley on Vimeo. Kitesurfing Gadgets – How high can you jump? If you have been following the latest tech news or even if you tried to stay away from it, you probably could not escape the trend of wearable electronics. From Nike to Samsung, pretty much everybody is trying to make some form of fitness tracker that will enable you to track your sport and of course post your progress online. While the usual trackers work well for sports such as running, skiing, snowboarding, etc. you will find it more difficult to find something that a kitesurfer is interested in. Just tracking the kilometers and time that you were on the water might be interesting but lets face it, what you really want is to tell everybody how high you can jump or how many G’s you experienced on impact. A young startup called Woosports is trying to accomplish just that with its WOO device. 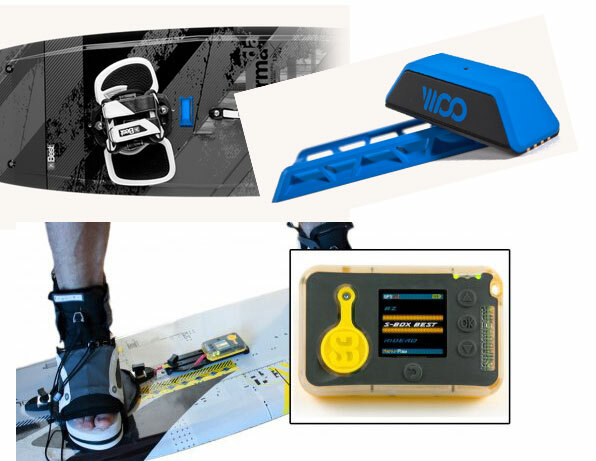 The shockproof and waterproof gadget is clipped onto your board and then collects all the data during your session. When you finished riding, you can upload it to your smartphone via bluetooth and charge it simply via USB. The idea itself is not really new and in fact has been already tried a few years back, when the first few accelerometer chips were starting to be mass produced for smartphones. back then the device was offered by Shadowbox Live and it was used and promoted by quite a few famous riders – Ruben Lenten among them. However, the device never really took off and now the company has disappeared. Maybe they were too early with the idea, maybe the initial cost of around 500 USD was a bit too much but without much doubt, the biggest issue was the precision of the device. Height can be measured either through GPS, an electronic barometer or using some rather complex math, based on the data from all given sensors. GPS is rather slow and for a quick jump, it often lags behind and will not capture the whole jump. If you ever used GPS navigation in your car, you might have had the problem of missing a turn off because the display was behind your actual driving. Some of this can be mitigated using accelerometer data but in kitesurfing we have one big issue – the kite jump is rather more complex. Unlike other jumps, we use the kite to glide to the water/ground and that means we do not just “jump” but actually jump and fly a bit. This means there is a quite a difference between the up and down part of your jump and to calculate that correctly requires a lot of data that such a device simply does not have (wind info, direction, kite size, your weight, wave or flat water take off, line length, etc.). ps: If you join our clinics, you won’t only get to actually jump higher but also get to take all the video and photos home that we shoot during your training! Contact us for available places. http://www.alwayswindy.com/blog/wp-content/uploads/2018/02/logo5ArialORANGE2018-340-156.jpg 0 0 Mark http://www.alwayswindy.com/blog/wp-content/uploads/2018/02/logo5ArialORANGE2018-340-156.jpg Mark2014-07-01 13:45:232014-07-01 17:37:57Kitesurfing Gadgets - How high can you jump?